All you need to know about the state of world trade. China’s September exports fell 10% from a year earlier, far worse than expected, while imports unexpectedly shrank 1.9% after picking up in August, suggesting signs of steadying in the world’s second-largest economy may be short-lived. That left the country with a trade surplus of $41.99 billion for the month, the General Administration of Customs said on Thursday. Analysts polled by Reuters had expected imports to rise 1%, after unexpectedly advancing 1.5% in August for the first time in nearly two years on stronger demand for coal as well as other commodities such as iron ore which are feeding a construction boom. Exports had been expected to fall 3%, slightly worse than in August as global demand for Asian goods remains stubbornly weak. Analysts had expected the trade surplus to expand to $53 billion in September from August’s $52.05 billion. The September import reversal raises questions over the strength of the recent recovery in domestic demand, Julian Evans-Pritchard at Capital Economics said in a note after the data. “The data we have so far suggests that a drop in import volumes of a number of key commodities, including iron ore and copper, are partly responsible,” he said. Xi continues to do two opposite things: blow bubbles and deflate them at the same time. My guess is there’s a time limit on that game. A wave of restrictions imposed on housing markets in major Chinese cities last week have unnerved some buyers and developers, cutting the area of new homes sold in places such as Beijing and Shenzhen by more than half. More than 20 cities have imposed measures, including higher mortgage downpayments, to cool hot property markets that have raised official alarm in Beijing and fresh concerns about China’s ballooning debt. Last week was a public holiday to mark National Day, traditionally a high season for property sales. Property agents said prices of new homes sold in the southern city of Shenzhen and in Beijing dropped 20% last week to entice buyers, compared with the previous week. “The new tightening measures are quite stringent,” said Alan Cheng, general manager of realtor Centaline Shenzhen. “It’s a blow to confidence and people are worried that prices will drop, so they are observing from the sidelines now.” The latest restrictions varied from city to city, but included higher mortgage downpayments for second and third-time home buyers, in a bid to stem the flow of cash into the red-hot property market. China’s home prices rose 9.2% in August from a year earlier, official data shows. But in Shenzhen, they increased almost 37%, in Beijing more than 23% and in Shanghai topped 30%. Such hefty price rises have been common all year in these so-called Tier 1 cities. The rally has prompted a frenzy among some buyers. In some cases, couples divorced to find a way around buying restrictions. How to make debt go away. Transfer it from state-owned firms to state-owned banks. Yeah, that should work..
Chinese firms are moving rapidly to announce debt restructuring plans following the release of government guidelines on Monday, as policymakers experiment with ways to rein in the country’s ballooning corporate debt. China Construction Bank, the nations’ second-largest lender by assets, has been reported in two deals to help big, debt-laden state companies in as many days, and other Big Four banks are expected to follow soon. Chinese companies sit on $18 trillion in debt, equivalent to about 169% of GDP, according to the most recent figures from the Bank for International Settlements. Most of it is held by state-owned firms. Construction Bank will conduct a debt-to-equity swap with Yunnan Tin Group, the world’s biggest tin producer and exporter, to cut its debt and financing costs, Xinhua reported on Wednesday. Actual rates are starting to creep up no matter what central banks do. Sign of the times. As pumpkins pop up on front porches across the nation, the highest interest rates in a month are scaring consumers away from the mortgage market. Total mortgage application volume fell 6% on a seasonally adjusted basis for the week ended Oct. 7, compared to the previous week, according to the Mortgage Bankers Association. The average contract interest rate for 30-year fixed-rate mortgages with conforming loan balances ($417,000 or less) increased to 3.68%, from 3.62%, with points increasing to 0.35 from 0.32 (including the origination fee) for 80% loan-to-value ratio loans. “As incoming economic data reassured investors regarding U.S. growth, and financial markets returned to viewing a December Fed hike as increasingly likely, mortgage rates rose to their highest level in a month last week,” said Michael Fratantoni, chief economist at the MBA. “Total and refinance application volume dropped to their lowest levels since June as a result.” Applications to refinance a home loan, which are highly rate-sensitive, have been falling for weeks, and took another 8% dive last week, seasonally adjusted. Mortgage applications to purchase a home fell a smaller 3% for the week and are 27% higher than one year ago. Comparisons to last year may be skewed, however, as new mortgage rules went into effect last October that pulled demand forward and then delayed mortgage processing. Charles asks: “Where will the money fleeing deflating bubbles go?”. But doesn’t add that much of it will simply evaporate. That’s what happens when bubbles pop. Everyone who’s not paid to be in denial knows stocks, bonds and real estate are in bubbles of one sort or another. Real estate is either an echo bubble or a bubble that exceeds the previous bubble, depending on how attractive the market is to hot-money investors. Here’s a look at the inflation-adjusted S&P 500 (SPX) and margin debt: yep, a bubble. 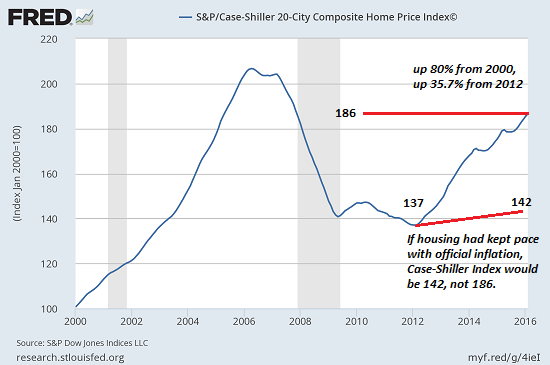 [..] Where will the money fleeing deflating bubbles go? Since the stock, bond and real estate markets are all correlated, it’s a question with no easy answer. What would $10 trillion seeking safe haven do to small asset classes such as precious metals, bitcoin, and tradable (liquid) sectors of the commodities markets? If the bubbles in bonds, stocks and real estate all pop, what markets will be left that can absorb trillions of hot money sloshing around? the short answer is: none. The chaos that will arise as trillions of dollars, yen, yuan and euros, etc. try to crowd through the fire exits as the asset bubbles pop will be monumental, and the the spikes in small asset class prices as the hot money floods in will be equally monumental. At least Ambrose doesn’t whine as much as many Brits do. “What [Hollande] is also admitting – à son insu – is that the union is held together only by fear. He might as well write its epitaph.” He’s writing his own epitaph, too. There may be serious economic trials ahead as we extract ourselves from the EU after more than forty years, but the slump in sterling is not one of them. The devaluation is necessary and desirable. The pound is now near ‘fair value’ based on the real effective exchange rate used by the IMF. All that has happened is a correction of the extreme over-valuation of sterling before Brexit, caused by capital inflows. This left the country with the worst current account deficit in peace-time since records began in the 18th Century. The fall is roughly comparable to the devaluation from 2007 to 2008 – though the same financial elites who talk so much of Armageddon today played it down on that occasion, mindful that their own banking crisis was the trigger. We can argue over how much the 2008 devaluation helped but it clearly acted as shock absorber at a crucial moment. It was in any case a far less painful way to restore short-term competitiveness than the ‘internal devaluations’ and mass unemployment suffered by the eurozone’s Club Med bloc. But there is a deeper point today that is often overlooked. Central banks across the developed world are caught in a deflationary trap. 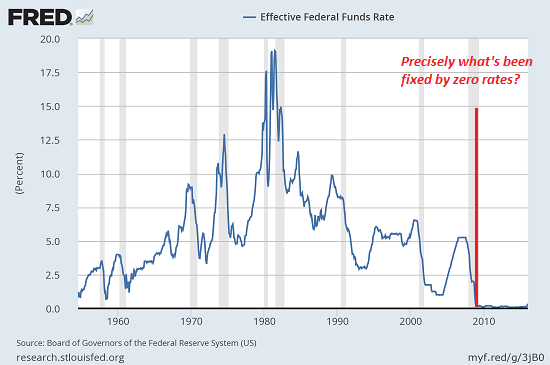 The ‘Wicksellian’ or natural rate of interest has been falling ever lower with each economic cycle and is now at or below zero in half the global economy, a full seven years into the expansion. This paralyses monetary policy and has dark implications for the next downturn. It is why central banks are desperately trying to drive down their currencies to gain a little breathing room, or in the case of the US Federal Reserve to stop the dollar rising. By the accident of Brexit, Britain has pulled off a Wicksellian adjustment that eludes others. These are remarkable comments in all kinds of ways, not least in that the leader of a democratic state is threatening a neighbouring democracy and military ally. What he is also admitting – à son insu – is that the union is held together only by fear. He might as well write its epitaph. Yet another example of why Britain should be delighted to leave the EU. But isn’t. If you still believe Britain will get a sweet deal out of Brexit because “the EU needs the UK more than vice versa”, ask yourself: why don’t we hear European politicians pleading with Britain “not to punish the EU over Brexit”? Why is the pound plunging against the euro and not the other way around? Why do we not hear of companies escaping from the EU to “free-trading Britain” while there is almost a traffic jam in the other direction? Why do EU leaders look rather relaxed when Brexit comes up, even cracking the odd joke or two about sending the British foreign minister, Boris Johnson, a copy of the Lisbon treaty so he can read up on reality? The negotiating cards with the EU are “incredibly stacked our way”, the Brexit minister, David Davis, told the House of Commons on Monday. The cards certainly are “incredibly stacked” – but not in the way Davis imagines. To understand why, get a map of the EU and find Slovenia, a nation of 2 million people. No, that is Slovakia, with 5.4 million, almost three times bigger. Next look up Lithuania (population: 3.3 million), Latvia (2 million), Estonia (1.3 million) and Luxembourg (500,000). Now repeat after me: all these EU members, as well as the other 21, hold veto power over whatever deal the UK (65 million) manages to negotiate with the EU (population: 508 million). That is right, 1.2 million Cypriots can paralyse the British economy by blocking a deal, and the same holds true for Malta (400,000). Did I mention the Walloon parliament in Namur (get that atlas out again) has veto power too? And then there is, of course, the European parliament in Strasbourg. Brexiteers argue that the EU takes ages to conclude trade deals so Britain is better off striking them on its own. The former is certainly true. Consider the Walloons currently threatening to derail an EU trade deal with Canada. But how does EU institutional sluggishness square with the Brexiteers’ promise that the EU is even capable of concluding a swift Brexit deal with the UK, even if it wanted to do? It doesn’t. And this is true even before we look at whether the EU would have an interest in making things easy for Britain. Remember how, before the EU referendum, David Cameron went to Brussels threatening to support leave unless he was given a range of “concessions”? Well, two can play that game, now that the tables have turned – except the EU has 27 nations. That is a lot of scope for blackmail à l’anglaise. A new torture technique. It’s a Good Cop Bad Cop set-up, but with three parties: EU, ECB and IMF, who keep on blaming both each other and the suspect, who may be innocent but is never released. Bit hard to find the best part. There’s a RealVision interview connected to it. What he is really focused on is here is reducing the debt burden and is inspired by US philanthropist Richard Vague, who started two US credit card companies, First USA and Juniper Financial — and now campaigns against excessive debt. “We have to cope with the residue, and it’s created this enormous pile of elephant dung of debt. We have to get rid of it. I’m simply being practical about how do we get rid of it,” Keen said. “He’s a totally realistic man (Vague), totally feet-on-the-ground personality. And he said, when you look at history, there has never been a successful episode of de-leveraging by growing out of it. It’s been debt write offs every last time. Somehow debts have been written off whether it’s being done at the individual scale by individual bankruptcies or some sort of collective action. Tidings of things to come. For the tiny little town of Loyalton, California, with a population of only 700, a failure of city council members to understand the difference between the calculation of a regular everyday pension liability and a “termination liability” has left 4 residents at risk of losing their pensions from Calpers. According to the New York Times, the town of Loyalton decided to drop out of Calpers back in 2012 in order to save some money but what they got instead was a $1.6mm bill which was more than their annual budget. For those who aren’t familiar with pension accounting, we can shed some light on the issue faced by Loyalton. There are two different ways to calculate the present value of pension liabilities. One methodology applies to “solvent”, fully-functioning pension funds (we call this the “Ponzi Methodology”) and the other applies to pensions that are being terminated (we call this one “Reality”). Under the “Ponzi Methodology,” pension funds, like Calpers, discount their future liabilities at 7.5% in order to keep the present value of their liabilities artificially low. That way, pension funds can maintain the illusion that they’re solvent and the Ponzi scheme can continue on so long as there are enough assets to cover annual benefit payments. Now, the managers of the pension funds aren’t actually dumb enough to believe that the “Ponzi Methodology” accurately reflects the true present value of future liabilities because they know that, particularly in light of current Central Banking policies around the world, their actual long-term returns will be much lower than 7.5%. Therefore, they have a completely separate, special calculation that applies when towns, like Loyalton, want to exit their plan. This “termination liability”, or what we refer to as “Reality”, uses a discount rate closer to or even below risk-free rates which means the present value of the future liabilities is much higher. As a quick example, lets just assume that Loyalton’s 4 pensioners draw $225,000 per year, in aggregate pension benefits, and enjoy a 2% annual inflation adjustment. Assuming a 7.5% discount rate, the present value of that liability stream is about $2.9mm. However, if the discount rate drops to 2%, the present value of those liabilities surges to $4.5mm…hence the $1.6mm bill sent to the Loyalton City Council. Kensington said this year was different because the finance companies were diminished and no longer in a position to take up the slack. “The money went to finance companies [before the GFC] who, having got the money, had to find a home and probably invested in the very things the banks had said no to. At least this time round there is not as strong a property finance company sector there to take up the slack when the banks said no. I’m sure if there was, they would happily bank some of this.” He added that there was a “real strain on the construction industry, labour costs are blowing out, and there are some shortages of building materials”. Prime Minister John Key yesterday told the Herald he stood by comments that young people should be looking to buy apartments as their first home. So go after him, I dare you. Wells Fargo Chairman and CEO John Stumpf, under fire for the bank’s sales-tactics scandal and his own handling of its fallout, is stepping down from both roles, effective immediately, the bank said Wednesday. Mr. Stumpf will be replaced as head of the third-largest U.S. bank by assets by President and COO Timothy J. Sloan, who was widely seen as his heir apparent. Mr. Stumpf won’t receive a severance package, the bank said. The board, at Mr. Stumpf’s own recommendation, had previously decided he should relinquish $41 million in unvested equity, one of the biggest-ever forfeitures of pay by a bank chief. He still retires with tens of millions of dollars earned during roughly 35 years at the bank. Mr. Stumpf’s departure comes after he was subjected to two grillings on Capitol Hill in which he was attacked by both Democrats and Republicans. The bank also faces numerous federal and state inquiries into its sales-practices issues, including from the Justice Department. The toppling of Mr. Stumpf, 63 years old and just shy of his 10th year as CEO, marks a stunning comedown for a firm that largely passed through the financial crisis unscathed and which was seen as a reliable Main Street lender. That reputation was shattered by the sales-tactics scandal, which revealed that bank employees had opened as many as two million accounts without customers’ knowledge. The bank has said it regrets the improper behavior, has ended sales goals for retail-bank employees and has been refunding customers improperly charged. The problems came to light Sept. 8 when Wells Fargo agreed to a $185 milion fine and enforcement action with regulators. That settlement also brought to light that the bank had fired 5,300 employees over a five-year period for improper behavior. This underscored the breadth of problems related to a hard-charging sales culture that pushed bankers to sell multiple products to individual customers. In Europe, when it gets serious, you have to lie… at least if you are an unelected bureaucrat like Jean-Claude Juncker. In Russia, however, when it gets serious, attention immediately turns to the children. Which is why we read a report in Russian website Znak published Tuesday, according to which Russian state officials and government workers were told to bring back their children studying abroad immediately, even if means cutting their education short and not waiting until the end of the school year, and re-enroll them in Russian schools, with some concern. The article adds that if the parents of these same officials also live abroad “for some reason”, and have not lost their Russian citizenship, should also be returned to the motherland. Znak cited five administration officials as the source of the report. Americans should vote for Donald Trump as president next month or risk being dragged into a nuclear war, according to a Russian ultra-nationalist ally of President Vladimir Putin who likes to compare himself to the U.S. Republican candidate. Vladimir Zhirinovsky, a flamboyant veteran lawmaker known for his fiery rhetoric, told Reuters in an interview that Trump was the only person able to de-escalate dangerous tensions between Moscow and Washington. By contrast, Trump’s Democratic rival Hillary Clinton could spark World War Three, said Zhirinovsky, who received a top state award from Putin after his pro-Kremlin Liberal Democratic Party of Russia (LDPR) came third in Russia’s parliamentary election last month. Nice country to live in. “That’s the next wave in the militarization of police,” Atkinson told The Intercept in an interview. “What we found was a whole slew of retired military officers now in the private sector now selling the exact same surveillance technology that they just got back from Iraq and Afghanistan with to local law enforcement for small money on the dollar.” The intent of “Do Not Resist,” Atkinson said, is to provide a glimpse inside the realities of American policing, challenge the policing-for-profit model that has caused departments in economically depressed communities to treat their citizens as walking ATM machines, call out a warrior culture that divides law enforcement from the public they’re sworn to serve, and flag the dangers of war-zone technologies being applied domestically. [..] All told, the team traveled to 19 states, went on roughly 20 police ride-a-longs, observed half a dozen raids, and interacted with hundreds of police officers. The hope was to be on-hand for an incident in which a SWAT team’s use of heavy weapons would be unquestionably warranted. “I thought the whole time I would be able to show something that would kind of reflect the entire scope of what a SWAT officer might go through sometimes, where you actually do need the equipment,” Atkinson explained. Instead, the filmmaker repeatedly found himself watching police with military-grade weaponry executing dubious search warrants. The frequency of the raids was particularly shocking, with one of the officers in the film claiming his team does 200 such operations a year. By comparison, Atkinson notes, his father performed a total of 29 search warrant raids over his entire 13 years in SWAT – according to some estimates, SWAT teams now carry out between 50,000 to 80,000 raids across the country annually. “The search warrants, we’re told, are always used for massive drug dealers and kingpins, and then we run in these homes and we never found anything,” Atkinson said. The real problem is that such a thing as a ‘seed and chemical industry’ exists at all. That agriculture has been just about fully taken over by 100+ year-old chemical companies that started out supplying death and now seek to control life, control our food to sell their chemicals, which our food doesn’t need. The global seed and chemical industry is undergoing a rapid realignment, with three massive deals in less than a year. Last month, Bayer clinched a bid to buy Monsanto, the world’s biggest seed company, for $66 billion, ending a months-long chase. DuPont and Dow Chemical plan a $59 billion merger of equals, while China National Chemical waits to complete its $43 billion takeover of Swiss seed maker Syngenta. While the dominant players get bigger, some independents look for advantages in research and development. About two-thirds of Stine’s employees work in R&D using traditional breeding techniques to improve corn and soybean genetics. The company sells these improved seeds to farmers and also licenses them to bigger companies like Monsanto that, as part of the bargain, give Stine Seed priority access to the newest genetically modified traits that help farmers control weeds and bugs. Get farmers to stop buying the stuff. International judges will take evidence from 30 witnesses and “victims” of US agri-business Monsanto in an attempt by hundreds of grassroots groups to hold the company accountable for what they allege are human rights violations, crimes against humanity, and “ecocide”, or widespread environmental damage. High-profile witnesses, including former UN special rapporteur on the right to food Olivier De Schutter, will give evidence alongside Argentine doctors, Mexican beekeepers and toxicologists and scientists from 15 countries. The five judges will deliver what is expected to be a lengthy advisory legal opinion. The three-day peoples’ tribunal, which will be held in The Hague this weekend, will adopt the format of the UN’s international court of justice but will have no standing in law. Organisers have described the hearing as a “moral trial” and “a test of international law”. “It aims to assess the allegations of harm made against Monsanto as well as the human health and environmental damages caused by the company throughout its history,” said a spokeswoman in London. The agro-chemical company, which is the subject of a £51bn takeover by German conglomerate Bayer, has declined to take part, or to defend its history at the tribunal. The company, which manufactured hundreds of thousands of tonnes of Agent Orange for use as a chemical weapon in the Vietnam war, is the world’s biggest genetically modified seed corporation. Monsanto developed toxic polychlorinated biphenyls and also makes glyphosate, the primary ingredient in Roundup, a widely used but controversial herbicide. The firm’s accusers in The Hague will hold it and other major chemical companies primarily responsible for developing an unsustainable system of farming. “Monsanto promotes an agro-industrial model that contributes at least one-third of global anthropogenic greenhouse gas emissions; it is also largely responsible for the depletion of soil and water resources, species extinction and declining biodiversity, and the displacement of millions of small farmers worldwide. This is a model that threatens peoples’ food sovereignty by patenting seeds and privatising life”, said the spokeswoman. Everyone’s happy to saddle Italy with the problem, same as Greece. It’s what the EU stands for. Poland, Hungary and other formerly communist states are firmly opposed to relocation quotas for refugees and say immigration, especially from the Muslim cultures of the Middle East, would disrupt their homogeneous societies. They also object to paying penalties for not taking people in. The financial transfers to less-developed areas of the EU from which they benefit, and which Renzi was referring to in his comments, absorb a large portion of the current €1 trillion EU long-term budget. The proposal for the next EU budget, for the 2021-27 period, is supposed to be completed by the end of next year. “The positive aspects of belonging to the EU must be balanced by the duties that come with membership,” Renzi said.